Daily household chores can be a pain. With ME it can be a killer. Hovering the tiniest room in my flat may mean I need to rest for half an hour afterwards. Add to that the fact that the chores never seem to end…every week that same floor has to be hovered, the bed is hoping for new sheets. You get the picture. During my rehabilitation at the beginning of this year, I discussed a lot of these chores with my occupational therapist. We looked at the way I did things and how we could make it less tiring and painful. It made me think. I know the chores are tough and tiring, especially in my situation, but approaching it like that won’t make it any easier. Nor does getting angry with myself when I’m too tired to even hold the vacuum cleaner. Slowly I’m finding a routine that works. I started by dividing my house in days. My living room is Monday, my bedroom Wednesday for example. The weekends I’m off duty. My flat has 5 rooms – and in this case I count the kitchen as a room and the bathroom, too. It only takes 5 days a week. Now, onto the cleaning. 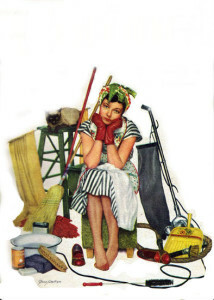 I actually don’t call it cleaning or household chores anymore. On Monday I pay attention to my living room. You heard it correctly, I pay attention. It sounds awfully Mindful, I do realise. It goes like this: instead of thinking “Christ, I have to clean this whole room…fuming!” I look around the room of the day and think “What in this room needs my attention?”. Hovering? Clearing up? Or maybe some styling? Dusting even? (the latter being my worst nightmare). Today, Tuesday, it’s my study’s turn. Study is the wrong word. It holds a desk and my piano, but is mainly used as a shed in which my laundry hangs to dry, too. It’s a difficult room. Looking around this difficult room, I noticed a lot of things needed my attention. So I did some little bits of everything. Clearing out – sometimes all of a sudden things are good for the recycle shop – and reorganising and after that I was ready for some hovering. All this in under 20 minutes. Instead of procrastinating, I went for it and it cost me less energy than those times I looked at it as chores. Okay, true, I needed to lie down for 15 minutes afterwards. But all in all: Winner! Guys and gals, this approach works for me. Like magic. The term “cognitive dysfunction” is given to symptoms which affect mental processes such as memory and reasoning, but is more commonly used by patients to describe any kind of brain symptoms. I’ve always put my cognitive issues down to having M.E., but people with Ehlers-Danlos, POTS, Fibromyalgia, Lyme and MCAD also suffer with brain symptoms, so cognitive dysfunction is common to many diseases. I travel. I don’t go to India or Peru. But I travel. And so far I’ve come a long way. Every day I come a long way. Some days the roads I travel were not made for travelling. But I travel anyway. We need to talk about ME. About why most things I do, I do “on character”. My head tells me to cook. Eat. Get up. My body tells me I can’t. My legs tell me to give in and collapse. Sometimes my body doesn’t tell me. No cues, no notice. Instead it simply does. But I just want to be. Young. Healthy. Living my life. Strong. Trying when everything feels like shutting down and giving up. Sometimes it gets the better of me. And even though I want to, there’s nothing I can do. This is why sometimes I can’t write. Why sometimes posts won’t be regular, daily, always happy. This is about why even a trip to the supermarket sometimes takes hours, if not days, to recover. And why all the fruit and sleep in the world won’t fix it. Nothing I can do about it. Other than giving in. Accepting. Trying to charge the battery. Dealing with and dividing my little energy. The day I got the diagnose I found my personal manual. I found ME. This is about Myalgic Encephalomyelitis. And from here I can continue my journey.